Dye the container of milk green with a few drops of food coloring. To prove that the leprechaun really visited, leave green footprints from the door to the refrigerator. Depending on how serious you are, the footprints can be made out of mud, glitter, construction paper or flour. Dye the water in the toilet green with food coloring. Dye the food of your choice green. Consider making green pancakes or green eggs for breakfast. Or even try to eat green food all day long. 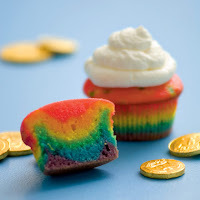 Bake up a batch of rainbow cupcakes topped with whipped cream frosting (for clouds) and a gold coin. To make the rainbow cupcakes, divide white cake batter up evenly between six bowls and add a generous amount of food coloring for vibrant colors in red, orange, yellow, green, blue and purple. Layer the batter in order (remember ROY G. BIV) in the cupcake liners and then follow the regular baking instructions. Visit Family Fun for more detailed instructions. Leave green post-it notes throughout the house with notes from your friendly leprechaun. The leprechaun has a hole in his money bag and drops gold coins throughout the house for your little ones to find. The leprechaun leaves clever clues throughout the house that eventually lead to a small pot of "gold" or other small gifts. Leprechauns love to play tricks. Consider swapping your child's sock drawer with the underwear drawer. Rearrange the furniture. Turn the kitchen stools upside down. Move the cereal bowls to a different cupboard. Leave the kitchen cabinet doors open. Fill the tub up with green balloons. Write a message in green soap (Irish Spring) on the bathroom mirror. Put a pair of shoes in the refrigerator. Leave a small gift of food or pennies out for the leprechaun before you go to bed. In the morning, a coloring book, crayons and gold coins appear in there place. Build a leprechaun trap together to try to catch the mischievous little bugger. Put a few drops of food coloring in the bottom of the glass and cereal bowl your kids will use. When they pour in the milk or drink, it magically turns green. Serve a traditional Irish meal. Listen to Irish music. Let everyone in the family know why you're lucky to have them in your life. Read more here. Of course, make sure everyone dresses in green.